Kanan officially has a mohawk courtesy of his eager father. We have since trimmed it since we took the photos as it flopped over a bit from the length. People our age love it. Grandparents hate it of course. We figure we should jack up his hair now while he is still too young to care. He got to show off his new do unofficially at the Matzke family reunion last weekend although when his great grandmother asked if we were enlisting him in the military, we decided it was a little too high and tight and not enough hawkish, so we sinced cut it more and that is what makes the reunion the unofficial debut of Kanan’s hawk. He also got to meet some more family that day including his second cousin Noah who is 7 months older than him. They were both too busy analyzing eachother during the family picture that they didn’t even bother to look at the camera. It was wonderful seeing family we haven’t seen in a long time. My cousins DJ, Tyler, and Trevor were there with my uncle Tim and his wife. I hadn’t seen the cousins for 15 years atleast—back when I would never had guessed I would have a son with a mohawk! Kanan got to show off the official hawk at his third cousin Robert’s 3rd birthday party by the pool in Pacific Beach. 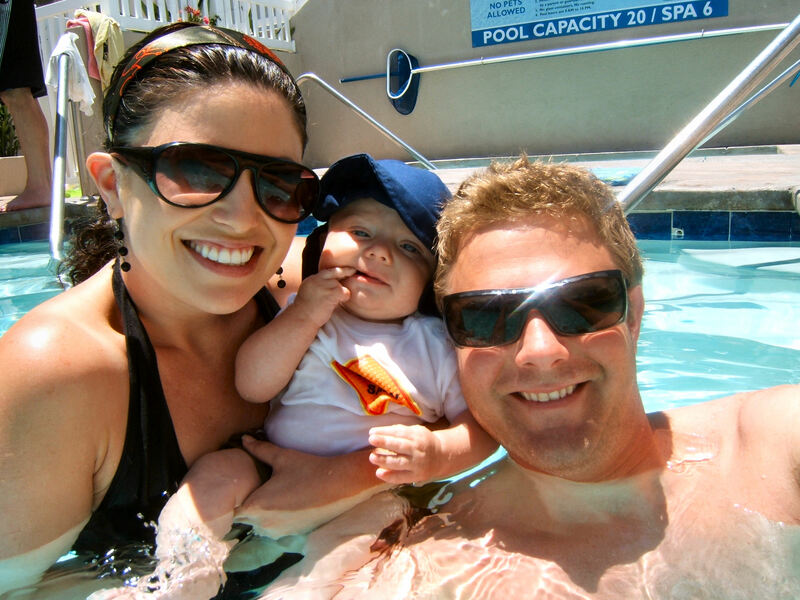 Kanan got to go in a pool for the first time and seemed to enjoy it as it was a very hot and sunny day. We slathered him in SPF 45 and dressed him a waterproof diaper, sunhat, and regular clothes because we lost his newly purchased swim trunks. Afterward he played in his pack and play for a bit instead of napping because there was way too much activity by the pool. We finally got him to go to sleep by taking him into the dark and quite Sauna in the back of the poolhouse. Don’t worry, it was turned off. He slept there for an hour and a half. I went back and checked on him every 5 minutes of course. After he woke up he was super happy and socialized with everyone. Toward the end of our stay, he got to try cake frosting for the first time although he was so exhausted by that point, I don’t think he truly enjoyed it as much as he could. All in all it was a fabulous day. We finished the night off by sleeping in the RV camper that night. Kanan, me, and Mike up on the bed and Smokey and Bandito down below in living area. The next morning, Kanan, who is not used to sleeping in the same bed as Mom and Dad, was so cute. He woke up smiling and kept looking back and forth at us as if to be thinking, “Dadda Mama, Dadda Mama.” I think he may of liked sleeping with us because last night when he was back in his crib for the night, he woke up every 1-2 hours all night long and boycotted sleeping entirely from 130-330. Of course by that time, I sent Mike in for a shift and when I went in to help him out, Kanan was all smiles and giggles as if that was his motive the entire time—to get Mom and Dad in his room for a slumber party. « A Pretty Darn Close-to-Perfect Day!